London, The Unicorn Press, 1960. FIRST EDITION. 8vo, pp. 246. 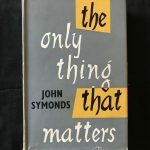 Bound in black buckram over boards, sliver lettering stamped to sine; with original dust jacket designed by Pulleyn-Holden (in good condition). Printed dedication to Jacques Calmy, a friend of the author, who was the founder of the Club Maintenant of Paris (renowned for Sartre’s famous talk “L’existentialisme est un humanisme” delivered there on 29 October 1945). 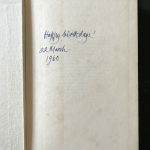 The present copy is inscribed on the front endpaper by Symonds for the birthday of his friend scholar and poet Michael Hamburger, born on 22 March 1924: “Happy birthday! / 22 March / 1960”. An excellent copy.